As part of the Boycott Israel Campaign we have been boycotting Coca-Cola for some time (see Coca Cola Boycott Page). For nearly 40 years Coca-Cola has been a staunch supporter of the apartheid regime occupying Palestine. 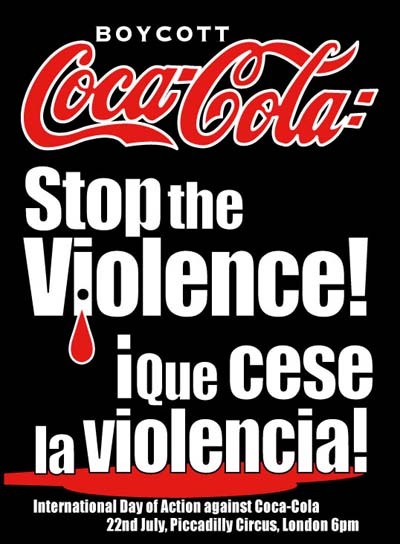 Now workers in Colombia have also launched a boycott campaign against Coca-Cola. Apparently Coca-Cola have been murdering union leaders in Colombia. We fully support their campaign. Its interesting to see that Nestle, another company we are boycotting, is also mentioned for its serious human rights violations in Colombia. Coca Cola and Nestlé both stand accused of serious human rights violations in Colombia. While Nestlé sack union members, Coca Cola kill them. Paramilitary Death Squads, acting under orders from Coca Cola management, have assassinated 8 trade union leaders in their workplaces. The union, SINTRAMINERCOL, has responded by calling for an international boycott of Coca Cola and all of their products, to start on 22 July. The incandescent red and white logo of Coca-Cola - the worlds fastest selling non-alcoholic beverage - has long secured its niche as the global mascot of The American Dream and the successes and happiness rendered by capitalism. This repression has helped Panamco S.A, Coca-Colas local franchisee, to drastically reduce their production costs by minimising salaries and firing over five-thousand workers whilst doubling their production, and their profits. The litany of abuses suffered at the hands of the paramilitaries includes the assassination of eight workers who were local leaders, three union members have been forced into exile, over sixty live under the shadow of death threats and some forty-eight others have been displaced. And he explains the corporation's attitude: Coca-Cola has turned from a time of exploitation to a time of slavery. Because the workers continue to resist this oppression the paramilitaries now try to kidnap family members, theyve burnt union headquarters and destroyed whatever evidence they can so we are unable to bring a case against them. If SINALTRAINAL is dissolved," adds Correa "we face assassinations". The Colombian state has neither investigated, brought to justice nor punished those responsible for the killings. So with help from the American Steelworkers Union, a federal court case has been put forward against Coca-Cola in the U.S. to gain reparation for the victims. Panamco has responded by taking SINALTRAINAL to the Colombian courts  renowned for corruption - with charges of calumny. Failed and abused by both the Colombian system and Coca-Cola, SINALTRAINAL has turned to the people and the international community to explain their crisis. Since July last year three International Public Hearings have taken place, the first in Atlanta in July, the second in Brussels in October and the final one in Bogotá on 5th December 2002. These hearings were a formidable expression of resistance. The aim? To denounce and combat the devastating effects of terrorism: both by the Colombian state and by the multinational companies.
" We are very encourage by the international response to our call to boycott Coca Cola products. The launch of the boycott will be world-wide." In the USA launch activities will take place at Coke's headquarters in New York and its main US production base in Atlanta Georgia, as well as San Francisco, Washington and Chicago. Groups will launch the boycott in Adelaide, Brisbane, Melbourne and Sidney Australia. The boycott starts in continental Europe with activities today in Berlin - Germany; Bern - Switzerland; Belgium; Madrid, Zaragoza and Viporoa - Spain; Rome and Perilla - Italy. There will also be a launch activity in South Africa, and the campaign has support of unions in Brazil, Chile and Venezuela. Sinaltrainal is working with Colombia's main union federation CUT and a range of organisations to launch the boycott inside the country. There will be a demonstration outside Coke's principal Bogota bottling plant, and activities in the regional capitals of Medellin, Cali, Barrancabermeja, Bucaramanga and Cucuta. The situation in Barrancabermeja is especially tense where, despite open paramilitary control of the city, a civic strike is expected this Thursday. In the UK various support groups are launching the boycott today in Bristol, Leicester and Totnes, Devon as well as in London. There has been a small breakthrough already in Totnes, where two cafe restaurants have already pledged not to sell Coca Cola products. Many more areas are expected to leaflet shops and consumers this coming Saturday. Javier Luis Correa calls for the support of trade unions, social movements and the general public internationally, "We are doing this to save the lives of our members." Eight union members and the wife of a Coca Cola worker have been assassinated. The International Day of Action to launch the boycott of Coca Cola was taken up by a number of groups with at least seven protest actions across the country, with news of more still coming in. The Colombia Solidarity Campaign group in Portsmouth had kicked things off the previous Saturday when they collected a thousand signatures from members of the public on a street stall. And today, 22nd July, the Campaign's rally in Piccaddilly Circus, a gathering point for tourists and young people in London's west end, this evening was a huge success. Hundreds of people listened to speeches and danced to samba rhythms as four 'waitresses' passed through the crowd offering Coke blood drinks. Marta Hinestroza, a refugee lawyer representing peasnt farmers displaced off their land by BP's pipelines in Colombia, called for a boycott of Coca Cola as representative of how multinationals are plundering the natural resources of the Colombian people, and using violent methods to crush opposition. Earlier in the day a group from the Cardiff Anarchist Network took direct action. They entered Coke bottling and distribution plant in Edmonton, north London. One of the protesters locked himself to a lorry, some locked the plant's gates while others pressed emergency buttons to stop the production line. During the two hour production stoppage for the emergency services to arrive the protesters meantime talked to workers inside the plant to explain their action. And the paramedic who arrived to assist the protester locked to a lorry turned out to be a representative of public sector union UNISON and was completely supportive. The protesters were detained by police, but released after Coca Cola decided not to press the charge of 'conspiracy to commit burglary'. One protester overheard Coke managers saying over the police radio that £30,000 worth of output had been lost. In Hammersmith, also in London, another group called International Socialist Resistance held a picket of Coca Cola's UK headquarters. The group reports protests in several UK cities, including Leicester, Newcastle, Manchester and Cardiff.